I haven’t gotten to this point in my Iceland adventure coverage yet, but I thought this image deserved its own post just because of the fun little story behind it. I took this photo on the night before our last road trip day. We stayed in Borgarnes, and I shot from the patio outside our hotel room. 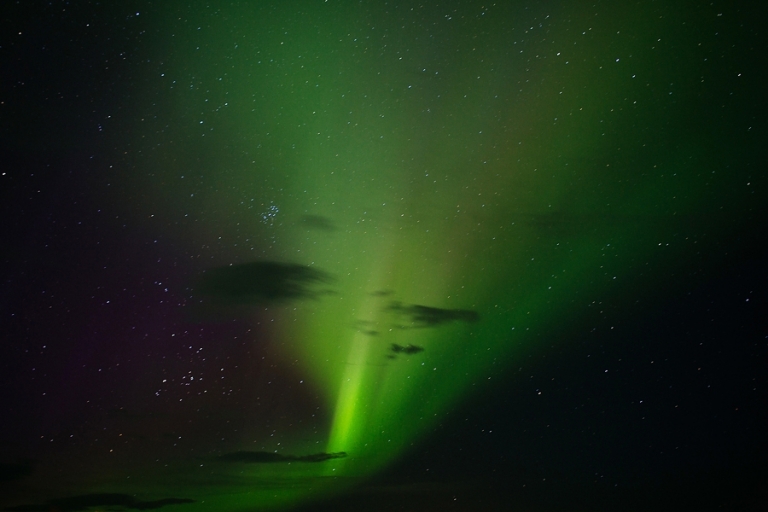 When I booked the trip, I didn’t have any expectation at all of being able to see the Northern Lights while we were in Iceland because they usually aren’t visible until at least September. But before we left the States, I read on a message board that the lights were visible as early as the week before our trip! So while I tried not to get my hopes up, I had also been following the forecast all week, and on Thursday night the Aurora Borealis forecast was marked as “moderate,” meaning there was a decent chance of seeing them. And as a bonus, our hotel was in a perfect dark area where we’d have very little light pollution to compete with the lights. When we checked in, I asked if I could please be placed on the wake-up call list for the Northern Lights and the concierge wrote my name down. Once we were in our room, I immediately set up my camera on the tripod and I dialed in a guess at what exposure settings might work (although I ended up changing them – this image was shot at ISO 200, f/2.0, with a shutter speed of 30 seconds). Chris and I went to sleep around 10:30pm hoping to either get a good night’s sleep OR get the call for the light show. As you can guess, it was the latter! When the phone rang at 1:30am I was SO EXCITED that I scraped my arm somewhere on the bed and had a weird wound on my elbow the rest of the week. I threw on some warm clothes and my shoes, and popped out the door to our patio. All of the rooms had their own exterior access (in addition to interior access), so that made it super easy to duck outside in the middle of the night. I was surprised to see that no one else was outside! It took a few minutes for my eyes to adjust, but once they did, I could see the lights and I started making images. Shorter exposures didn’t really seem to capture the vivid colors, so I ended up trying 30-second exposures and even longer. Unfortunately with the really long exposures, I have some tiny star trails that aren’t long enough to be interesting, and they’re just short enough to look blurry so the photos are just okay. But this image below is the one that worked out, and I’m happy to have it even though it meant I was very (very very) tired the next day. After the excitement of seeing the lights and taking pictures, I couldn’t fall asleep again until after 4am. I’d love to see the Northern Lights again someday (maybe in Norway or Sweden?) especially since I think this was a small/short show, but for now I can officially cross it off my bucket list!